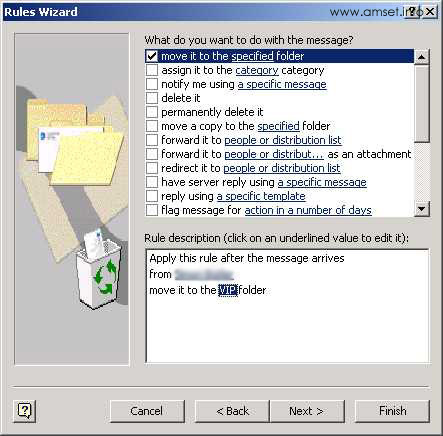 You can use the built in Rules wizard to create more sophisticated rules than the basic options allow. 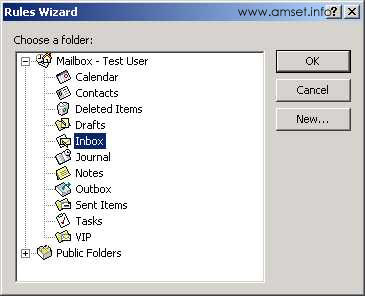 These screenshots were taken from Outlook 2002 connected to an Exchange Server. The screens for other versions of Outlook and when Outlook is collecting email direct from an ISP using POP3 email servers are very similar. 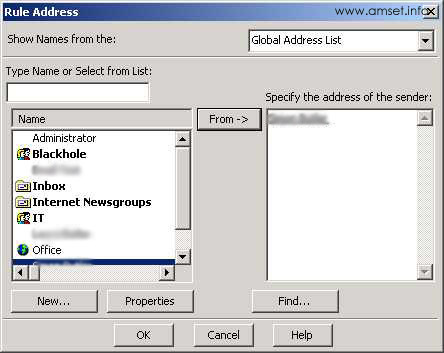 A version for Outlook 2003 is in preparation. 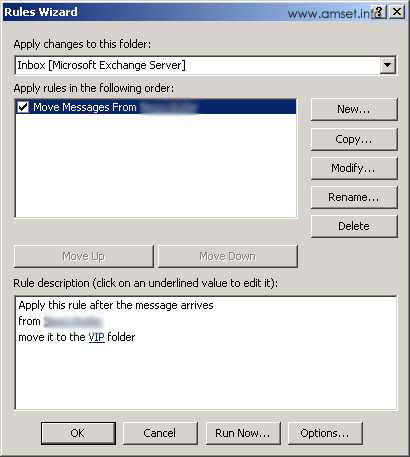 Note: If you are going to create a rule to move messages to another folder, then you need to create the folder before you begin the process. Click on Tools, Rules Wizard to bring up the initial Rules Wizard Screen. Click on "New.." to add a new rule. ... or start with a blank message. After making your choice, click on Next. Which ever option you choose, you have to first choose what condition you want the rule to check for. There is quite a list, but in this example we are building a rule to move message from a certain user. However the basic principles are the same. Click on the underlined condition "People or Distribution List" to choose the user. You will be presented with the address book to choose the person or list (lists are shown in the address book in BOLD). You should then click on the line marked "Specified Folder" to choose the folder that you want to move the messages to. If you haven't created the folder, then cancel out of the wizard and create it. After pressing OK, you will be returned to the main rules wizard. At this point, you can press finish. The rule will work. However if you want to run it on email messages you already have, or refine the rule to include exceptions and other actions you need to continue. Press Next to move through the advanced options. On the first screen you can specify additional actions to carry out. On the next screen you can set any exceptions to the message. Perhaps you don't want the message to be moved if there are certain words in the subject, or it is sent to a list. Finally you can give the message a name and decide whether you want to run it on email that already exists. When complete you will be returned to the main rules wizard dialogue where you can see all of your rules. After creating your rules, you may want to modify them slightly to include the command "Stop Processing Further Rules". If you are moving messages to another folder then this step will improve the performance of Outlook quite considerably. You should also look at adding further options to the rules so that it works exactly how you want it to. If you have created a large number of rules, you can export them. Click on options to Export your rules. This is useful if you want to move them to another machine for an upgrade or to have as a backup in case of failure. 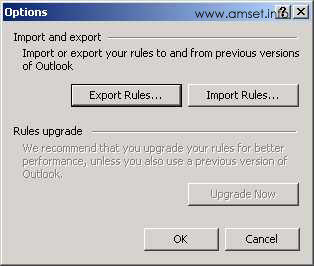 Q: When I enter Outlook Rules Wizard, it keeps asking me to Upgrade my Rules. How do I do That? 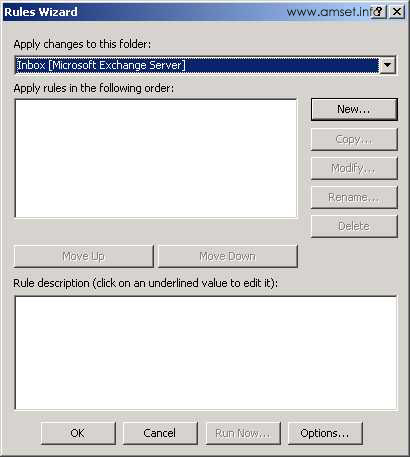 A: If you have been upgraded from Outlook 2000 to Outlook 2002/XP, the rules are handled in a different way. 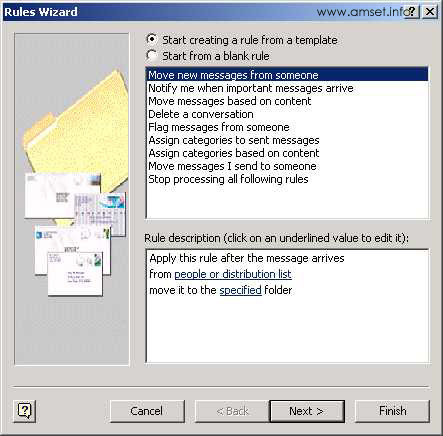 To upgrade your rules to the new formatting, click on Tools, Rules Wizard. Then click on Options and choose the upgrade rules button. Q: Why do some of my rules not work when Outlook is closed? 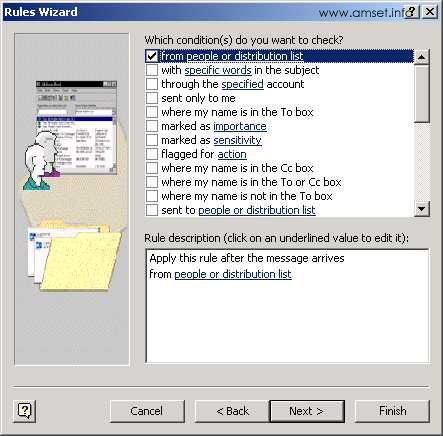 A: There are two types of rules in Outlook. These are client side and server side. The rules that are not working are probably client side. Server side rules live on the server and continue to operate even when Outlook is not open. 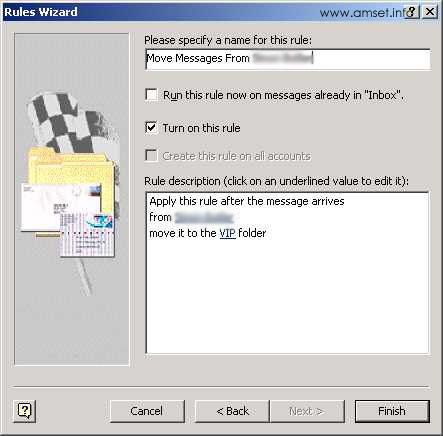 If you use another copy of Outlook, the rules will be available. 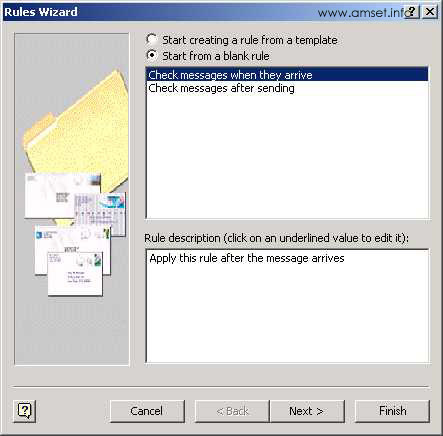 Client side rules are rules that operate only when Outlook is open. They are usually only available on one particular client, so if you use another machine, the rules will not be there. You should remove these options from your rule and it will work offline. 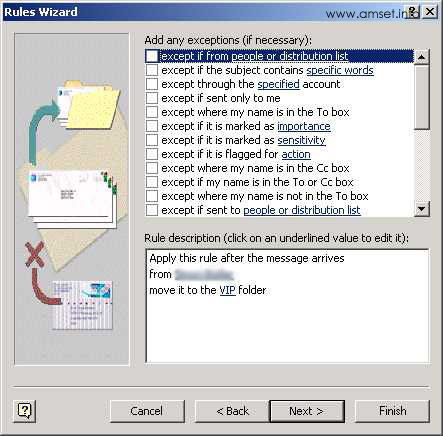 You can get more on using rules in this article on Microsoft's Office web site.